We are officially in homeschool mode and it’s exciting to feel the stress level lower, no longer hear myself yelling, see my son happier and more free than he was in public school. It’s day 3 and I can see things improving already! I’m not completely naive, I know there will be bad days, but I’m so happy for my son and feel like this was the best decision we could have made. I am excited to share one of our first projects, an informational writing project. 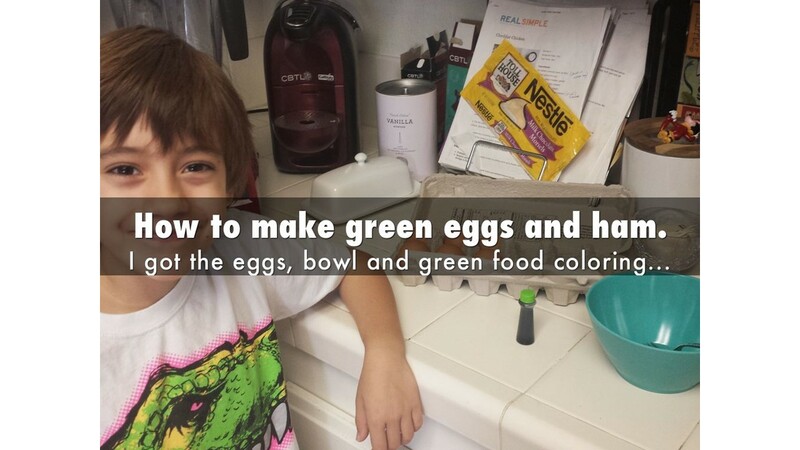 Little man has been wanting to make green eggs and ham for a few days now so we finally went to the store to get the food coloring and made it! The fun part was documenting each step and then putting the pics together in a simple presentation that he narrated using Haiku Deck Editor. I just found this program but I love that we can save it in multiple formats. Thanks! I’m sure we’ll use it again!